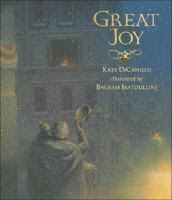 Speaking of JOY today - Candlewick Press sent me a copy of Great Joy to read this Christmas season and it was one of the books my kids and I opened this past week to read. Of course, DiCamillo is no stranger to the children's book scene but I'm rather slowly becoming familiar with her work. In this particular story, we meet a little girl who notices an organ grinder and his monkey across the street from her apartment building. The girl is very concerned about this pair, hoping that they have a safe and warm place to be at night during the Christmas season. Her mother rather dismisses the young girl's concern but the daughter is persistent. She stays up until midnight one night and then sneaks to the window only to discover that the organ grinder and his monkey are still on the curb. They have no place to go. Moved with compassion, the girl invites the organ grinder (and his pet!) to the Christmas pageant at her church. Whether or not they attend will have to be something you discover if you pick up the book. As for my children, my four year old found Great Joy the most appealing and asked for three re-reads in a row! So I think it's safe to say he liked it. I did too. Again, there is a slightly weak parental figure but I think the story is told in a tasteful enough way to express the young girl's longing to see the man and his beloved pet taken care of during the holiday season. In the end, I have no objections. This is a quick picture book and one that I'm sure we'll enjoy a time or two in the coming years. Thanks, Candlewick, for sending a copy my way! We read a library copy of this last year and enjoyed it too. Touching story. I absolutely loved this one and so did my mom. I did wonder a little bit about it's appeal to children. Compassion...so needed at time of year when too many of us are preoccupied with STUFF instead of PEOPLE...Jesus didn't come for stuff...he came for us. This looks like an excellent choice. LOVE, LOVE, LOVE DiCamillo. Will be adding this one to my Christmas basket wishlist! Will see if our library has this. I appreciate Christmas books that are not about Santa, presents, etc.